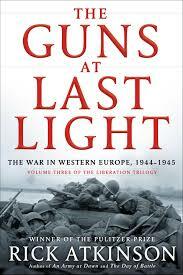 The final installment of Rick Atkinson’s WWII trilogy, THE GUNS OF LAST LIGHT, offers prodigious unsettling detail of the final push to defeat Hitler during the winter of 1944 and the spring of 1945. 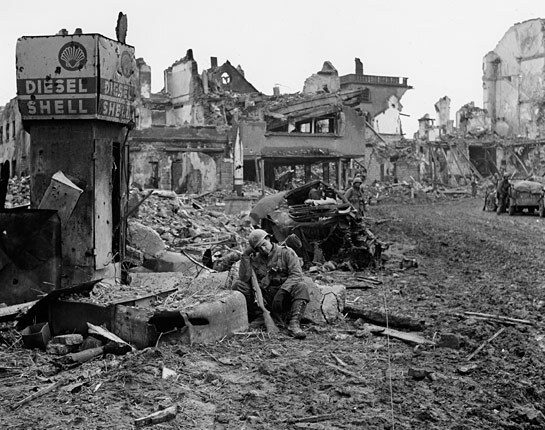 The book begins with D-Day continues through the Normandy hedgerows, the liberation of Paris, Operation Market Garden and the Battle of the Bulge. Atkinson’s narrative spares no detail and his criticisms of Allied leadership are jaw dropping. In his epic account of the final months of the war, Atkinson creates no heroes. His depth of research renders judgement on the good and bad. American deaths in the winter of 1944 at the Bulge alone totaled 19,276. In the final year of the campaign of 135, 576 American soldiers were killed on the Western Front while military bureaucrats meticulously planned the up coming Yalta conference between Roosevelt, Stalin and Churchill. Millions of dollars and endless hours of planning and logistics were spent on caviar, wild game, wines of every description, imported silver, cigars, china and furniture. Little was accomplished at Yalta, increasing speculation on how Germany would later be carved up among the victors. This is a book for students of WWII history and the reader will be well rewarded by the depth of its six hundred plus pages. Atkinson’s work qualifies for my Every Word Counts honor. The two other volumes equally worthy of accolades are An Army at Dawn, the North Africa Campaign, (search gordonsgoodreads), The Day of Battle, the war in Italy. I can not resist sharing this quotation from the book. Patricia O’ Malley was a one year old when her father, Major Richard James O’Malley was killed by a sniper at Normandy. Later as an adult she wrote this following a visit to her father’s grave at the cemetery at Collerville above Omaha Beach. I cried for the joy of being there and the sadness of my father’s death. I cried for all the times I needed a father and never had one. I cried for all the words I wanted to say and wanted to hear but had not. I cried and cried.